We have all had an “enemy” at one point or another. That enemy could come in the form of an angry friend, offended coworker, disgruntled relative, or a cantankerous boss. They’re upset with us or have done us wrong, whether we deserved it or not. We didn’t ask to be hated, but hated we became. The temptation was to jump on the band wagon of unforgiveness and frustration right along with the enemy. God, however, has a different opinion on the subject . . . a very different opinion. In fact, it’s so opposite from our logic, it makes our skin crawl. Feed your enemy? That would mean being nice. Why would anyone want to be nice to their enemy after all they’ve done? Surely God was mistaken. It just doesn’t make sense! However, to God it is the only way to beat an enemy. When I was younger, we lived on a residential street of middle class homes. Next to us was a vacated home with the driest yard in town. Out of the blue one day, a black circle of burned grass showed up in that yard. My mom saw it and knew there had been foul play. So, like a dutiful neighbor, she went across the street to the neighbor’s house. They had two boys who had been known to play in the damaged yard. Mom simply asked if the boys had been playing with fire in that yard or knew about the burned spot. The other mom rose up in mother hen furry and lost her temper with mom, very indignant that someone would insinuate that her sons had anything to do with it. Mom went home with an unseen black eye. Here she had a choice. Would she become upset at her neighbor for being angry unnecessarily, or would she “turn the other cheek”? I’m proud to say that Mom decided to heap great coals of fire on the lady’s head. To work she went, taking Proverbs literal by baking up a fresh loaf of homemade bread. Once pulled from the oven, steaming and warm, she confidently took the loaf across the street to the neighbor as a peace offering. Whether the woman showed appreciation for it at first or not, Mom’s work of love paid off shortly after. Our neighbor mom came knocking at our door, an apology on her lips. The coals had worked. Giving a “heap” works wonders for both us and the person offended. It first forces us to forgive and put some action behind that forgiveness. The fleshly desire to “get even” or “hold a grudge” is forced to stand up against the fruit of the Spirit. Pride goes out the window because holding an offense and giving a gift just can’t happen at the same time. Receiving a “heap” is painless physically, but it does a powerful work on the heart. The enemy’s offense is challenged by an act of love, bringing conviction that what they have done was wrong. This opens the door for reconciliation, followed by a peace stronger than their hate. Most importantly, when we do good to our enemy, it is showing the mercy of Jesus to that person. They didn’t deserve nice treatment, but now they are being lavished with a gift far greater than a loaf of bread. 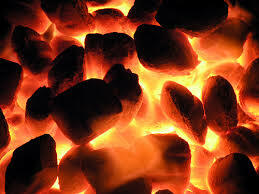 Jesus heaped the greatest heap of coals that anyone could heap. All through His ministry, men challenged His teaching and hated everything He did. Then out of jealousy, they demanded His life. When they beat Him past the point of recognition, and His wounded body was hung on the cross, He spoke the famous words, “Father, forgive them, for they know not what they do.” (Luke 23:24) He didn’t demand compensation or justice; He simply “heaped coals” on fire with love. Proverbs 25:22 tells us that God will reward us once we’ve heaped our coals of forgiveness. Jesus received His reward – exaltation and the Name above every Name. (Philippians 2:9) If God was faithful to honor His Son with everything promised, He will be faithful to reward us for our obedience. Heaping great coals of fire could never been so beautiful! I will never forget the words of Christ leaping off the page at me… in the 7th chapter of Matthew… that we will be eternally judged by the measure that we have judged others here on earth. Years have flown by but His words remain deeply embedded in my actions and heart.